Heino Kuhn will captain Kent while Sam Billings and Joe Denly are away playing in the Indian Premier League. 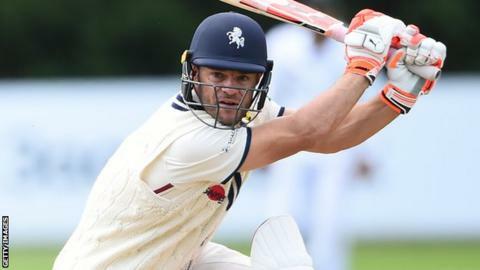 Ex-South Africa batsman Kuhn, 34, had a crucial role in the club's promotion to Division One last year, scoring 780 runs at an average of 33.91. Regular captain Billings will play for Chennai Super Kings in the IPL, with vice-captain Denly representing Kolkata Knight Riders. The IPL starts on Saturday and runs until 5 May. Batsman Daniel Bell-Drummond will be interim vice-captain at Canterbury. "It raised a great debate amongst us about who was the right person for the role," head coach Matt Walker said. "We could have gone a bit more of a left-field route and really thrown someone the gauntlet for this small period but I think we're in safer hands with Heino. "I wasn't quite sure whether he was going to want to do it, having only been here for a year, but he was very much up for it and felt very honoured to be asked. "It's the obvious choice in many ways in terms of his experience, international quality, the way he goes about his business as a professional and everyone respects very highly." Kent start their County Championship season against Somerset at Taunton on 5 April.